Woodlawn! | NJNA is Blogging! I am very excited that for the first time ever I have two pieces of my work entered in an exhibition. 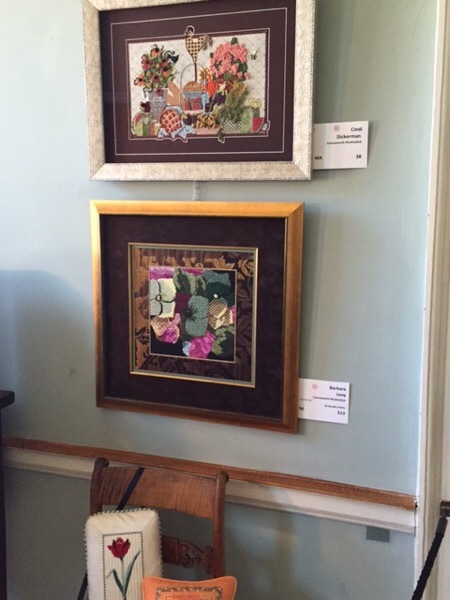 I was encouraged by my fellow ANG chapter members to submit an entry to the Woodlawn Needlework Exhibition and Sale. 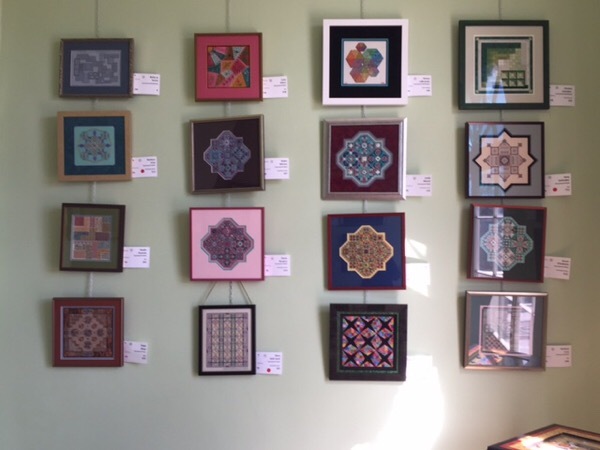 So I dove in and sent two pieces down to the exhibit with Linda M and Mr. M.
There was no doubt I would go and look at all the needlework since I have a good friend who lives in the area. Of course the only time our schedules aligned, was for opening day. So off I went. It was a beautiful, but blustery day and I had the best time ever! The next day, I set off for Woodlawn. As one pulls up the drive, the mansion looks quite majestic. Of course once I got inside, there was the usual confusion in regard to the “other” Barbara L. There was only one Barbara L listed in the program, so I had to explain there were two of us when I checked in. That Barbara lives near Woodlawn, so she has been involved with the exhibit for many years. So, now I was inside the exhibit and there was such eye candy! The work across all media was really breathtaking. I saw cross stitch pictures that looked like photographs and stump work that had incredible detail. The gold work was amazing. I did find amusement that the morning guides were from the local garden club and I did a bit more explaining to them than the other way around. Yet, they were quite charming and lovely to chat with. 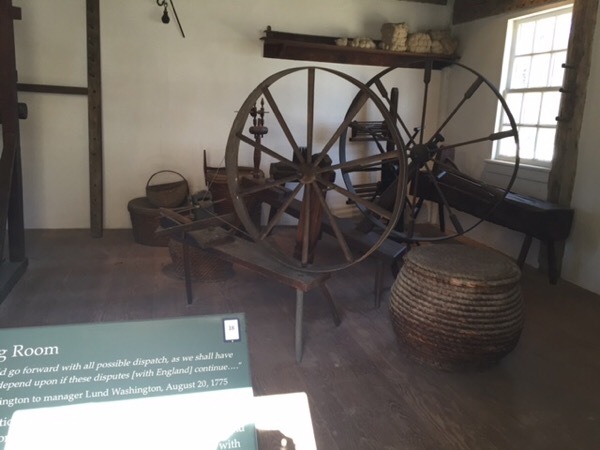 They did explain some interesting things about one or two of the pieces in each room. One thing they did explain was that the ribbons had not yet arrived. So, on the name tags, the entries that won ribbons had different colored dots, indicating their place. Of course I couldn’t tell what the different categories were. I also over heard that people who had entries could have the guides get a docent and then they could take a photograph of their own entry. 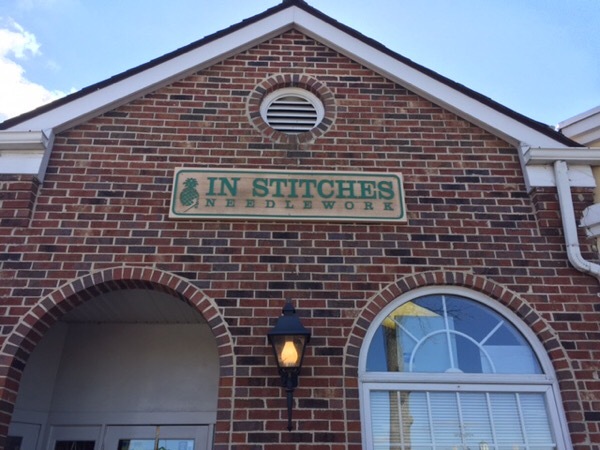 You know I was really there to see the needlepoint, dot or not. I loved it! There is a lot of talent out there. Finally, I hit the dining room and there was my hydrangea piece hanging on the wall. I was excited! Now, I started to look for the chapter display in earnest. It was no where to be found on the ground floor. I went upstairs and I still didn’t see them. Finally I went into a bright sunny room that had no furniture, but a whole uninterrupted wall for display. There they were! I also saw my second piece, which was a Tony geometric counted piece. However, I quickly looked away because I noticed Mary D’s piece ( I believe it is her Frankie piece) had a red dot on it! I was so excited for her. I quickly tagged the guide to find out what she had won and it is a second place. Sorry that I don’t know the category. Congratulations Mary! At any rate, I began to look at the wall in earnest and it was then that I noticed that my name tag had a red dot also. I kept looking back to make sure my eyes weren’t playing tricks on me. What great positive reinforcement for a first time exhibitor! I also noted with amusement that the “other” Barbara L. had a piece on the same wall. Thankfully, the two pieces were labeled correctly. I took one last look around and then I was off to In Stitches. I had a very nice visit there and bought a few notions. I found a reproduction magnet with an embroiderer on it. 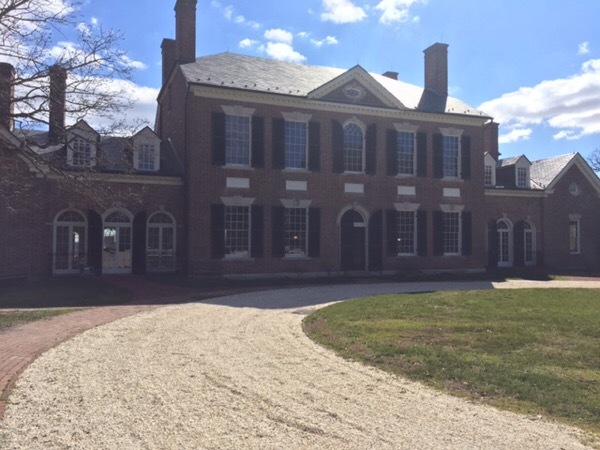 Keeping with the historic theme, I decided to visit Washington’s mansion at Mt Vernon. I think the last time I was there, I was about ten. Needless to say, the park service has made vast improvements. 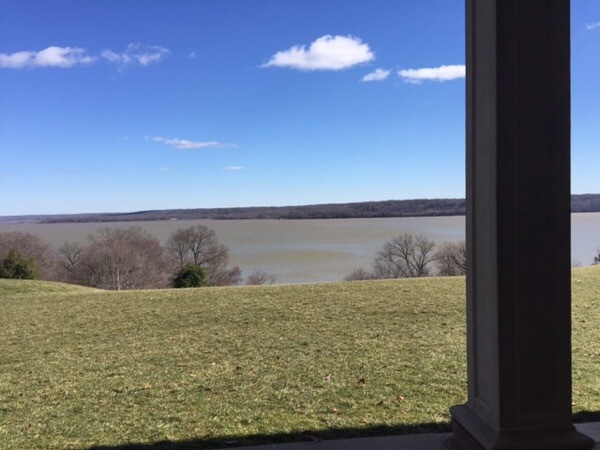 No photographs allowed inside, but here is a panoramic view of the Potomac. 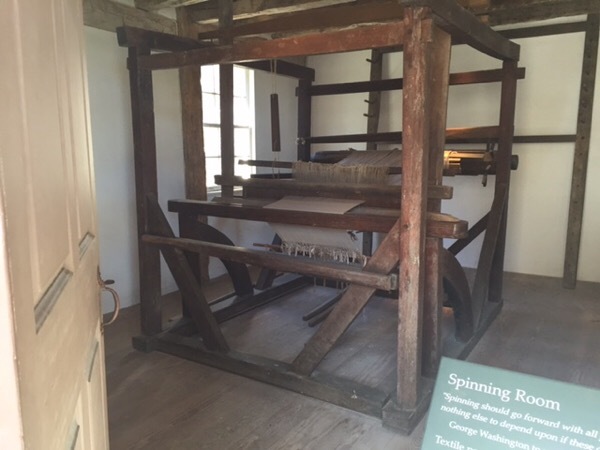 For you knitting and weaving enthusiasts, here are some photos of the spinning room, which is an outer building. Of course no day would be complete for me without a stop at a local yarn shop. 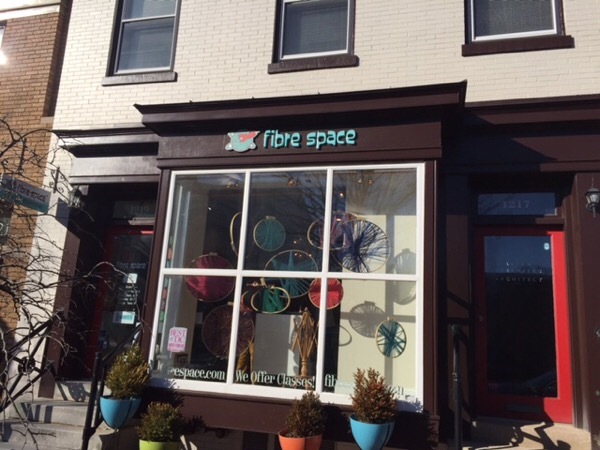 I went to Fibre Space in Old Town Alexandria. What luscious yarn, some of which is locally dyed. However, I was able to stay on my yarn diet by focusing more on notions. 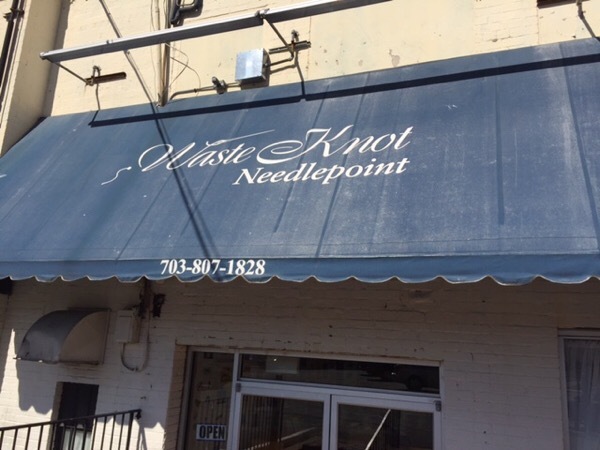 They had a new needle that I had never seen before. It looks like a boomerang and is used in place of double point needles. Really interesting. So my fun day came to an end. I felt really happy and satisfied. I encourage all of you, if you can, to go south and take a visit to Woodlawn. Congratulations to Barbara and Mary on their ribbons! The exhibit was awesome and we were so glad we made the trip to see it. I even saw a few pieces that I have in my stash (many of them samplers) and am inspired to dig them out. Thank you to all of our members who entered pieces for this exhibit. It was great seeing all of them – and I made sure that I found each one. Let’s start thinking about next year. BTW, Ann, the woman who worked to get all the pieces registered two weeks ago, remembered me and stopped to chat when I walked through the exhibit. How nice to be part of that kind of community!